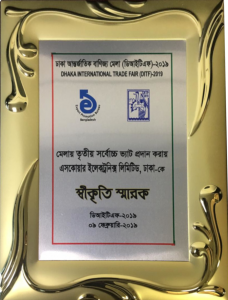 Esquire Electronics Ltd. has participated in Dhaka International Trade Fair consistently for many years. We are committed to bringing you the best products from international brands SHARP and GENERAL at the best prices and discounts. And this year the love and support from our customers has propelled us to new levels of success. We are proud to announce that Esquire Electronics has been awarded the Third Highest VAT Paying Company at the DITF 2019. It was possible entirely through the support of our customers and the tireless effort of our employees at our exclusive pavilion. We would also like to acknowledge everyone who worked behind the scenes by providing support and encouragement throughout the entire fair. We would once again like to thank our customers for continuing to put their faith in us and we hope to bring more products that make life better. Esquire Electronics Ltd believes in responsible VAT payments. VAT is an important element to a healthy and functional economy and Esquire Electronics Ltd. believes it is the responsibility of corporations to do their part in maintaining and enriching the economies they benefit from. VAT collections help ensure that necessary finances are available to the government for the development of a nation. Esquire Electronics Ltd. therefore encourages all companies to pay their VAT in a timely manner and help build a better Bangladesh. About the Author: Esquire Electronics Ltd.
Agreement Signing Ceremony Between Esquire Electronics Ltd. and Unilever Bangladesh Ltd.
Esquire Electronics Goes Live from Narda Showroom! Esquire Electronics Ltd. is a Member Unit of Esquire Group, one of the most well renowned and respected business conglomerate of the nation. They started operations in the year 1977 and almost through 4 decades they have been trying to meet the household needs for consumers with quality electronics appliances. Esquire Electronics Ltd is the Authorized Sole Distributor for the Japanese Giant Electronics Brands GENERAL and SHARP. Esquire takes great pride in being one of the top choice of consumers by placing utmost importance on quality, service and trust; and till now they have been uncompromising to ensure consumer satisfaction at the highest level. © Copyright Esquire Electronics Ltd. 2018 - 2023. All Rights Reserved.